Sunday February 16 1908 It was quite cold today. I went down to church and after that to see Dr Smith. It was so late the car was gone so I went over home to dinner stayed till 4.15. I got some supper and read and wrote in the evening. My conference with Dr was very satisfactory today. I feel better I think Monday February 17 1908 I did a washing before noon. It was such a bright day After dinner I did some cleaning up about the house, sewed a little and ironed after supper. Will went up i the country to a sale in the afternoon. 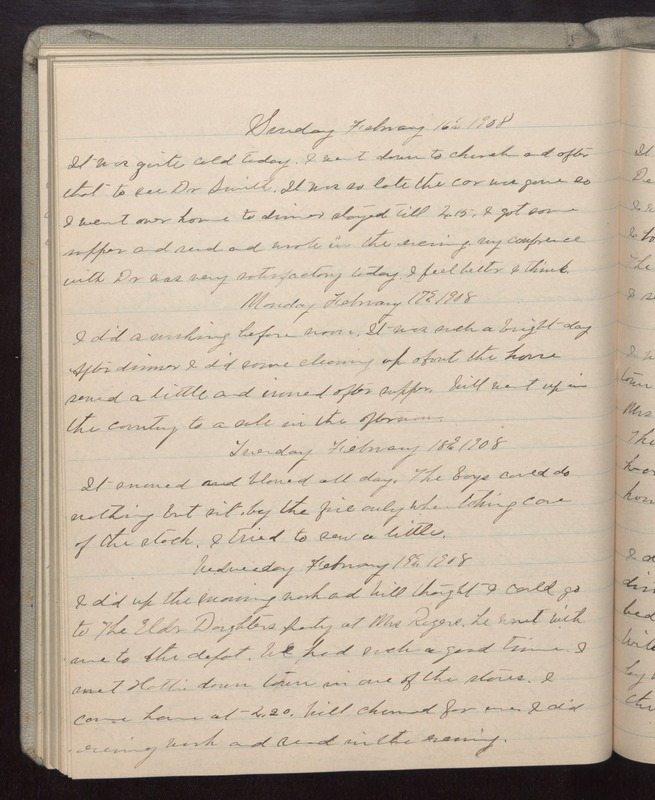 Tuesday February 18 1908 It snowed and blowed all day. The boys could do nothing but sit by the fire only when taking care of the stock. I tried to sew a little. Wednesday February 19 1908 I did up the morning work and Will thought I could go to the Elder Daughters party at Mrs Rogers. he went with me to the depot. We had such a good time. I met Hattie down town in one of the stores. I came home at 4.20. Will churned for me. I did evening work and read in the evening.